Experience the friendliness and warm hospitality of South Haven at its best when you stay with Shores Vacation Rentals. Whatever the size of your group, the reason for your visit, or the time of year, Shores will have the perfect South Haven vacation rental for your family, small group or that special romantic weekend. 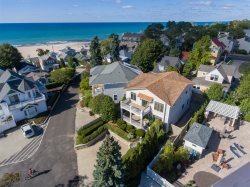 From large beach houses to cozy cottages, to lakefront homes and condos, contact us today and let us help you plan the perfect vacation on the beautiful shores of Lake Michigan. We have more than 75 vacation properties to choose from. Need extra help planning your vacation? Then be sure to contact the South Haven Visitors and Convention Bureau for useful information on area activities, restaurants, shopping and upcoming events. The knowledgeable staff answers thousands of questions each year from people around the world, and people just down the road. If you're a first time visitor or seasoned vacationer, the Bureau is a valuable vacation planning resource for planning your visit to South Haven. Heres a complete selection of over 75 vacation properties including homes, condominiums, lakefront and pet friendly. When you vacation in South Haven or Saugatuck and want to bring your dog along for the ride, select from these dog friendly vacation rentals. We welcome you and your pet.